This article of Geeabo teaches you How to Revert Back Sent Mail in Gmail. Friends, many time it happens that you send an e-mail on wrong ID by mistake and after that you start getting bothered. And friends, you start getting bothered when you send an important professional information to wrong ID. And the result of this is that your essential information leaks up. But friends, now you can correct the hasty mistake. Now you can Revert Back Sent Mail in gmail. And today, I will be talking about this important topic. Guys, now Gmail also provides the facility of revert back sent mail (Undo Send) to the wrong person accidentally. How To Recover Deleted Gmail Account. So, Let’s know How to Revert Back Sent Mail in Gmail (Official Way). 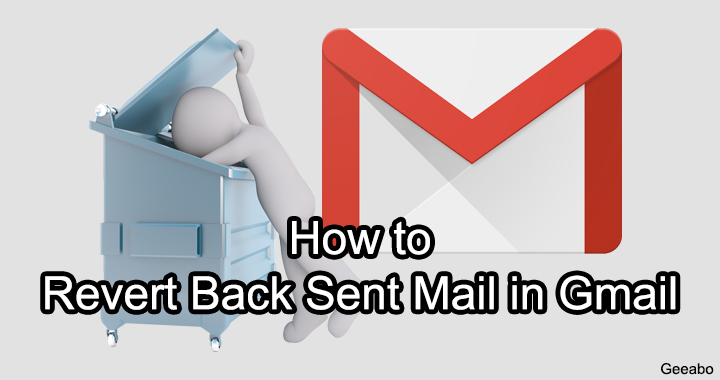 Simply follow the few simple steps to Revert Back Sent Mail in Gmail. Now move your mouse cursor to the top right corner and click on the Settings option under menu which is below your profile picture. After go to settings option, scroll down and here you find an option of ‘Undo Send‘. 4. Now enable the ‘Undo Send‘ feature by clicking on the check box next to it. After that you will see a option of ‘Send Cancellation Period‘ below the Undo Send option. Under the ‘Send Cancellation Period‘ option, set the send cancellation period to (5-30) seconds. After changing the settings, now scroll down and click on Save button to save the settings. Now you successfully activated the Undo Send feature of Gmail. Now friends, whenever you will send an e-mail to someone’s mail ID, then your mail will be saved for a fixed period. And you will see an option to undo the sent mail. How Can I Logout Gmail Account From All Devices. So, this was the full procedure to Revert Back Sent Mail in Gmail. When you send a no-take-backs email – maybe an admission to a secret crush, or accidental reply-all – there’s an instant pang of regret. It feels like there’s no going back. Meet Gmail’s Undo Send feature, a lifesaving little hack buried in the Gmail Labs settings. It gives you a 10-second window to “undo” sending an outgoing email. 1. Click the gear icon in the top right corner of your Gmail window and select Settings from the dropdown menu. Thanks for the Comment, Aneez!